No cross reactivity to IRAK-1. Synthetic peptide corresponding to Human IRAK-1 aa 700-712 (C terminal). THP-1 or HeLa whole cell lysate. Affinity chromatography purified via peptide column. Our Abpromise guarantee covers the use of ab238 in the following tested applications. WB 1/1000. Predicted molecular weight: 80 kDa.Can be blocked with IRAK-1 peptide (ab6230). (THP-1 or HeLa whole cell) from non-activated cells. Binds to the IL-1 type I receptor following IL-1 engagement, triggering intracellular signaling cascades leading to transcriptional up-regulation and mRNA stabilization. Isoform 1 binds rapidly but is then degraded allowing isoform 2 to mediate a slower, more sustained response to the cytokine. Isoform 2 is inactive suggesting that the kinase activity of this enzyme is not required for IL-1 signaling. Once phosphorylated, IRAK1 recruits the adapter protein PELI1. Isoform 1 and isoform 2 are ubiquitously expressed in all tissues examined, with isoform 1 being more strongly expressed than isoform 2. 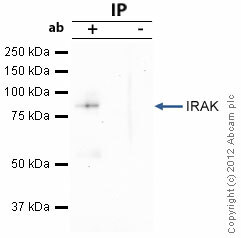 Autophosphorylated or is transphosphorylated by IRAK4 following recruitment to the IL-1RI. In the case of isoform 1, this is linked to ubiquitination and degradation. Polyubiquitinated; after cell stimulation with IL-1-beta. Polyubiquitination occurs with polyubiquitin chains linked through 'Lys-63'. IHC image of ab238 staining in human breast carcinoma formalin fixed paraffin embedded tissue section, performed on a Leica BondTM system using the standard protocol F. The section was pre-treated using heat mediated antigen retrieval with sodium citrate buffer (pH6, epitope retrieval solution 1) for 20 mins. The section was then incubated with ab238, 1µg/ml, for 15 mins at room temperature and detected using an HRP conjugated compact polymer system. DAB was used as the chromogen. The section was then counterstained with haematoxylin and mounted with DPX. 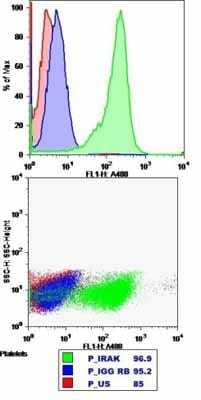 Flow Cytometry - Anti-IRAK-1 antibody (ab238)Image courtesy of an anonymous Abreview. 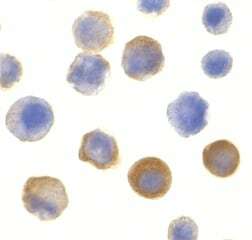 ab238 staining IRAK-1 in Human platelet cells by Flow cytometry. Immunocytochemistry/ Immunofluorescence - Anti-IRAK-1 antibody (ab238)Image courtesy of Dr Mahesh Shivananjappa by Abreview. ab238 staining IRAK-1 in murine RAW 264.7 cells by Immunocytochemistry/ Immunofluorescence.Cells were fixed in paraformaldehyde, permeabilized using 0.1% Triton-X100 in 2% BSA for 15 minutes, blocked with 2% BSA for 1 hour at 22°C and then incubated with ab238 at a 1/150 dilution for 16 hours at 4°C. 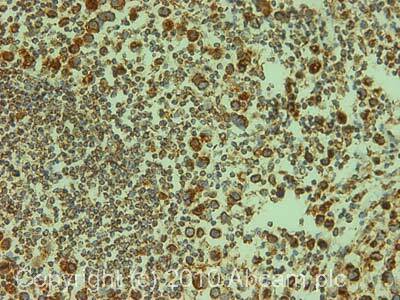 The secondary used was an Alexa-Fluor 488 conjugated chicken anti-rabbit IgG (H+L) used at a 1/1000 dilution. 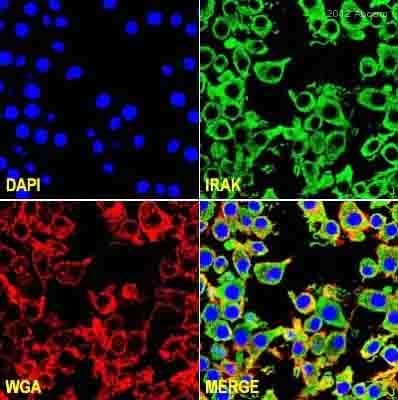 IRAK-1 was immunoprecipitated using 0.5mg Hela whole cell extract, 5µg of Rabbit polyclonal to IRAK-1 and 50µl of protein G magnetic beads (+). No antibody was added to the control (-). 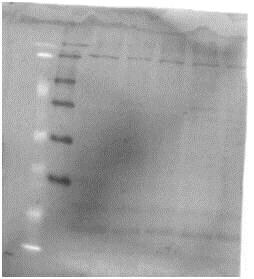 Proteins were eluted by addition of 40µl SDS loading buffer and incubated for 10min at 70oC; 10µl of each sample was separated on a SDS PAGE gel, transferred to a nitrocellulose membrane, blocked with 5% BSA and probed with ab238. Immunofluorescence of IRAK-1 in HeLa cells using ab238 at 20 ug/ml. Publishing research using ab238? Please let us know so that we can cite the reference in this datasheet. Thank you a lot - I will let you know how it worked!!! I have checked your new order 1217270 and it looks that both antibodies (abhttp://ops.adminsite.com/admin/data/fs_ab.cfm?&intAbID=119289 and abhttp://ops.adminsite.com/admin/data/fs_ab.cfm?&intAbID=135027) are out of stock at the moment. We have reordered the items but it may take a week to get them. According to our record, we should be able to get them by 18th December. Could you please drop me an e-mail to confirm if you are happy to wait. I apologize for any inconvenience caused and look forward to hearing from you soon. Thank you for the reply and helpful comments. This is to confirm that I have placed a new order for you - for one vial of ab238 and another vial of ab64171 as free of charge replacements and the new order number is 1217226. I would kindly advise you to run a non-stimulated positive control cell line which expresses the target protein endogenously and to apply lysis buffer (i.e. RIPA) which contains a mixture of different proteinase inhibitors to prevent the degradation of the protein of interest. I hope the second vials will perform better, and please do let me know how you are getting on with these two products. Sorry that siRNA file did not come through, I am sending it again. Please find siRNA experiment attached. Both CARD10 and IRAK1 are highly expressed in keratinocytes. There are downstream effects - knock-down of CARD10 results in reduction of IL8 and CCL5, knock-down of IRAK1 results in production of IL8. mRNA results are very nice. Please look also your own webpage: Your different CARD10 antibodies run on very different sizes - why it is like that? If you cannot really replace the antibodies, can we please get at least 50% reduction when we buy new ones? This is an important experiment thatt we need for publishing. Thank you for getting back to me and for passing some useful details. Your co-operation is much appreciated. I can certainly offer replacement vials to you if you wish to carry on with the experiments. Could you please confirm the Abcam Order Number or you Purchase Order Number and the date of purchase. One more comment that RT-PCR data should be treated carefully since, there is no clear correlation between mRNA and protein levels and sometimes it is not easy to predict the protein expression levels from quantitative mRNA data. There are several publications available which delineate the technical boundaries of the approaches for quantitative analysis of protein expression and reveal that simple deduction from mRNA transcript analysis is insufficient. Please do let me know how you wish to proceed with your enquiry. I look forward to hearing from you soon. Thank you for the reply. Here are my answers to your questions. About the siRNA experiment: siRNAs were purchased from Life Technologies, Transfected using lipofection (siPORT-NeoFX, Life Technologies agian) for 72 hours, some of the cells were induced with IFNgamma for 48 hours. For illustration, I add the results in Powerpoint file which shows that siRNAs work on RNA level and there are downstream effects on cytokine production. I also include WB picture again and our order as PDF. With best regards and thank you for the help. I can find the 3 pdf files attached to your response but it seems that the ppt (Powerpoint) file did not come through. Have you done a time-course experiment with siRNA treated cells to select the most optimal time point for the studies? How have you selected the sequence of siRNA? Have you tried more than one SiRNA sequence? Could you check if the sequence corresponds correctly to IRAK and CARD10 protein? Have you used the correct endogenous positive and negative controls? Have you applied scrambled siRNA or standard negative siRNA controls? Since the cells are stimulated with IFN gamma, this may modify/alter the expression pattern of the target. It would be worth running good positive control alongside with the samples. It would be also be worth checking the cell viability after treatment. I am great fan of your antibodies. I have used them in many applications including ChIP, WB, IP, IF etc. But now we have got problem with two antibodies - the recognized bands are with wrong size. The result does not correspond with other results we have in mRNA level and according to downstream effects. Our other data is convincing and nice, but we cannot get the results with the antibodies listed here. The image is attached. Western:SDS-PAGE, sample in 1xSDS loading containing 100 mM DTT. Image is attaced.We have performed several experiments in different other conditions - no help! Can you please replace these products with other prodducts from your company? With best regards and with hope we can solve the problem. I am sorry to hear that you have been experiencing problems using these two products (ab238 and ab64171) in the application that you wish. Thank you very much for sending the WB images. Could you please provide some further details of the protocol used and complete the following form (attached as a word document). I purchased one antibody form ABCAM (AB238) for introcellular staining(for flow cyt). I saw the datasheet said the incubation time is 16 hours in 4 degree. In our routine protocol , this step for all antibodies is only 30 minutes in 4 degree, so why this one takes so long? is there some special binding character for this one? I can confirm that the protocol for flow cytometry that we know of for this antibody includes an incubation time of 16 hours at 4C. Please feel free to use your standard protocol if you find that this is working too for this antibody. In case the staining is week I can suggest too prolong the incubation time. A longer incubation will achieve an optimal saturation. If in your hand a shorter incubation time is working well, i would like to encourage you to also write an Abreview. Other researchers will value this information. And you would earn Abpoints that can be redeemed as discount on future purchases or as Amazon vouchers. I tried to altered the steps of blocking and primary antibody at RT or 4 degree and other way round, but results were the same. I am sorry to hear that the result did not improve. To proceed further in this case could you let me know, how the antibody was stored and what was the purchase order number? Thank very much for your cooperation in this case! Thank you for submitting an Abreview of ab238. As you may have noticed, your review has now been published on our website. Since you obtained poor results using the antibody in a tested species and application, we would like to follow up on this to see if we can possibly improve the results you are seeing with this antibody. Based on the information in your review, I feel that altering the step in protocol may help toimprove your results. Did you try any troubleshooting of protocol? Additionally, this antibody is covered by our Abpromise, so if the antibody was purchased within the past 6 months, I would be happy to discuss a refund or replacement with you to resolve this issue.